Join us a live show with Flatt Lonesome, rescheduled from December 8 to Sunday, February 24, 2019 at 7:30pm. Tickets are $25 in advance, $30 day of show. If you purchased tickets to the original December 8 show and are unable to attend the rescheduled event, please contact us at info@floydcountrystore.com by December 31 for a refund. Since their debut in 2011, Flatt Lonesome has enjoyed a nearly unprecedented trip to place them among bluegrass’ elite. Bluegrass Today calls them “the sort of band bluegrass needs right now” and says their brand of original bluegrass is “some of the freshest our genre has been offered in a while.” Stellar picking and heartfelt songs centered around beautiful sibling harmony have made Flatt Lonesome a hit among bluegrass fans both young and old and their vibrant, youthful spirit with careful respect towards tradition has earned the praise of peers twice their age. Kelsi Robertson Harrigill (mandolin), Buddy Robertson (guitar), and Charli Robertson (fiddle) founded Flatt Lonesome in 2011 along with neighbor, Dominic Illingworth (bass) and longtime friend, Michael Stockton (dobro). Paul Harrigill (banjo) joined in early 2012. After the band’s debut at the 2011 SPBGMA Band Competition (where they took third place! ), interest began growing in these young bluegrass performers from Callahan, FL. The buzz only grew as Flatt Lonesome returned to and won the competition in 2012. 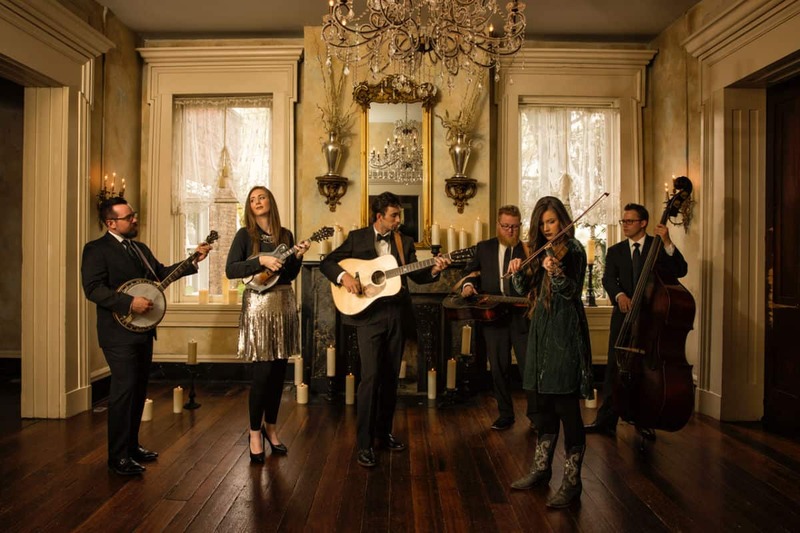 Flatt Lonesome released their self-titled debut album in early 2013 and drew high acclaim from both critics and fans. The album’s opening track, “You’ll Get No More Of Me” scored the band their first number one hit. The band followed up their successful premiere with Too, released in July 2014 on Mountain Home Records. Flatt Lonesome’s sophomore album debuted in the Top 5 on Billboard’s Bluegrass Album charts and produced eight charting singles across four major radio charts, with “So Far” reaching number one in the fall of 2014. Flatt Lonesome also won their first IBMA award in 2014, being named Emerging Artists of the Year at the IBMA Awards Show in Raleigh, NC. The major success of their second release has since been eclipsed by the overwhelming enthusiasm surrounding Flatt Lonesome’s third album, Runaway Train, released in October 2015. Runaway Train highlights the band’s evolution into a bluegrass tour-de-force. The album features seven original compositions, including the band’s first recorded instrumental, alongside tasteful renditions of songs from the catalogs of Gram Parsons, Merle Haggard, and Dwight Yoakam. While Flatt Lonesome are top notch musicians, the hallmark of their sound is their stunning vocal ability, and Runaway Train features plenty of inventive vocal arrangements and heart-stopping harmonies to excite any fan. Runaway Train received Album of the Year honors at the 42nd Annual SPBGMA Awards in early 2016, where Flatt Lonesome was also named Best Overall Bluegrass Band. The album has also generated six charting singles thus far, including the smash hit, “You’re The One.” Reaching number one multiple times, “You’re The One” has been one of the most-played bluegrass songs in the country this winter. Including “You’re The One”, Runaway Train has generated three top five hits thus far, with another reaching the top ten. Flatt Lonesome has also become the darlings of the historic Grand Ole Opry. After making their Opry debut in August 2015 (a dream come true), they have made seven Opry appearances to rave reviews, receiving the praise of such country stalwarts as Vince Gill, Steve Wariner, Connie Smith, Josh Turner, Lauren Alaina, and more.